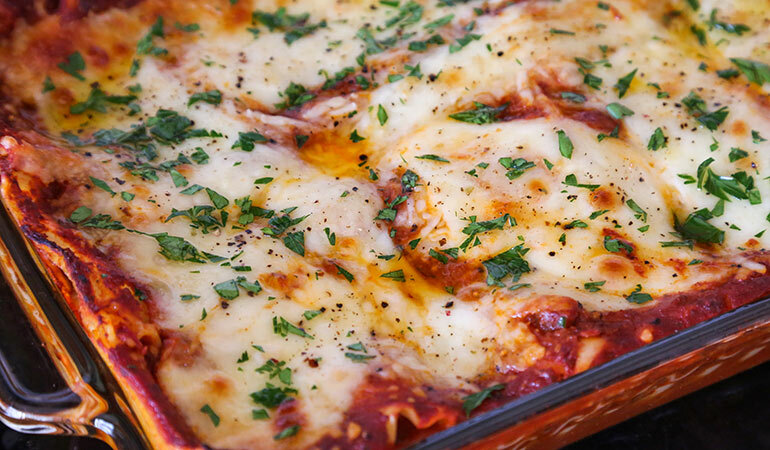 Lasagna is an easy way to feed a crowd, and it’s equally tasty with venison. One pound of meat seems standard in most lasagna recipes, but being a meat lover, my husband thought it was a bit light. Add more venison if desired and adjust cheese to your liking. Heat 1 tablespoon of oil in a pan over medium heat. Add chopped onion, basil, oregano, thyme and a pinch of salt, and sweat until translucent, about 5-7 minutes. 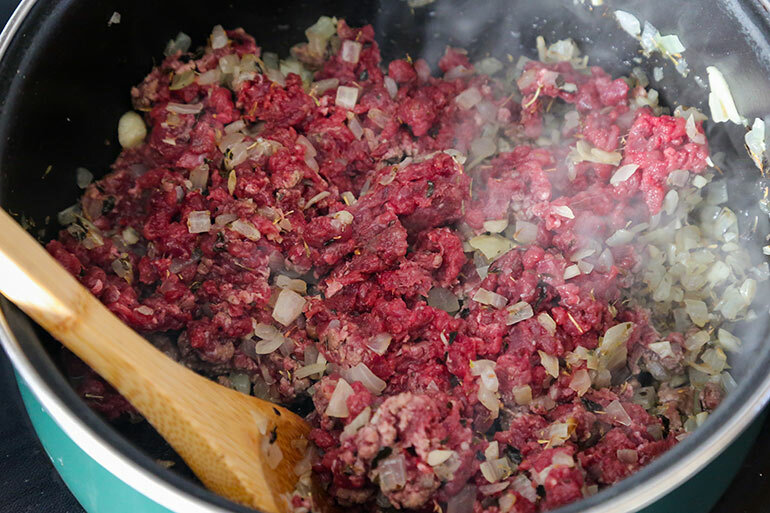 Turn heat up to medium-high, add ground venison and brown, stirring occasionally. Add garlic and stir for 30 seconds. Add red wine and allow to reduce by half. Next add 1 ½ jars of marinara sauce to the venison mixture and bring to a simmer. Take off heat when warmed through. Grease a 9x13 baking dish. 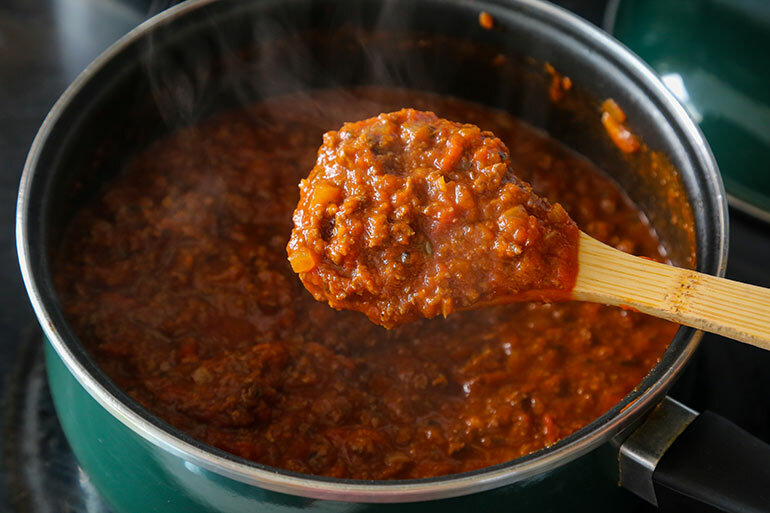 Spread half of remaining marinara sauce onto the bottom of the dish. Then line the bottom of the dish with a layer of lasagna pasta. On top of that, spread on some of the meat sauce, mozzarella cheese, a few dollops of ricotta cheese, and Parmesan cheese. Place another layer of pasta on top and repeat twice more. After putting down the last layer of pasta, spread the rest of the meatless marinara sauce on top and cover with mozzarella and Parmesan cheese. Cover the dish with foil and cook for 30 minutes in a 375-degree oven. Remove the foil and continue baking until cheese turns slightly golden. 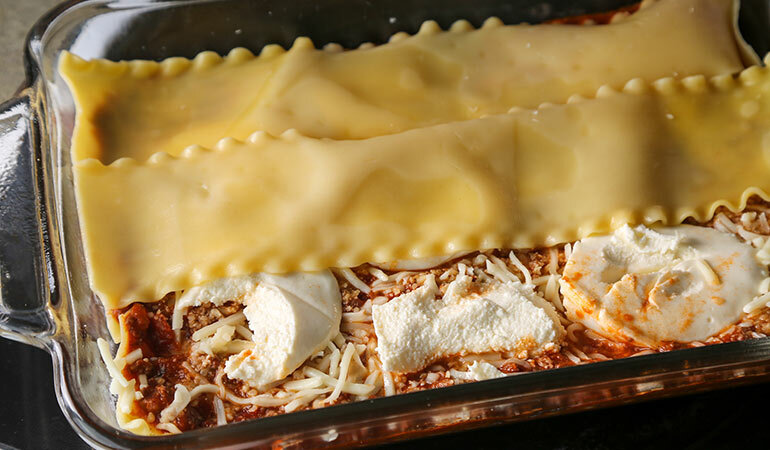 Allow lasagna to rest for 10 minutes before cutting and serving. Garnish with chopped parsley.